Corn planting: How early can one go? Researchers from various regions of the Corn Belt have estimated optimum planting dates for corn by examining how yield changes with planting date. Data from the northern US indicate that the corn yield in this region is greatest for planting dates in mid-April to early or mid-May and then decreases with later planting dates. The Ontario Ministry of Agriculture, Food, and Rural Affairs (OMAFRA), in its Agronomy Guide for Field Crops, gives optimal dates of “on or before May 7 in southwestern Ontario and May 10 in central and eastern Ontario.” However, there is a fair amount of year-to-year variability in the relationship between yield and planting date. Indeed, knowing the optimal planting date is important, but many other considerations come into play when growers are deciding how early they can begin to plant corn in the spring. “When I talk to growers, the first thing would be the window of time they have to get their corn acres in. If it’s a grower who has eight or 12 days of corn planting, he probably has to look at starting as early as it’s fit to start,” says Fred Sinclair, product development manager for Pride Seeds. Seed treatments can provide some degree of protection to seeds that must sit in cold soil, improving their chances of emerging and progressing as expected. Greg Stewart, corn specialist at OMAFRA, and Mervyn Erb, an independent crop consultant located in Brucefield, Ontario, have similar ideas about taking an early window of opportunity to plant at least some fields in April. “If you have a window of opportunity in April when the soil is in good physical shape from a moisture, friability, and soil–seed contact perspective, then you’re tempted to plant on those days, regardless of whether the soil is still cold. If it starts raining on April 30 and rains for 10 days, you will have missed your opportunity to plant early, and that is probably much more of a yield sting than what you might experience by planting in soils that are cold,” says Stewart. Seed treatments for diseases and insects have also improved, say King and Sinclair. So even if the seed is planted in fit conditions and then must sit in the soil for a couple of weeks for whatever reason, it is protected from diseases and from insects that might start to feed on it. “Those improved seed treatments definitely have allowed us to plant earlier,” says King. Barfoot states that Agricorp relies on OMAFRA’s recommendations for sound farm management practices. “If our customers are doing anything that is not recommended or is outside of accepted practices, their insurance coverage could be jeopardized.” When a claim is submitted, the adjustors take into consideration what practices were used in planting the crop, including soil fitness. In the end, it comes down to a judgment call. “It’s too early to plant when the soil conditions are not right,” says Jean-Marc Beneteau, a grower located in Essex county, Ontario, and a director of the Ontario Corn Producers’ Association. He stresses that it is important for a grower to know his own fields. “Farming is not a science, it’s an art. It’s not that you stick a thermometer in the ground or you take a shovel of soil and you see that it’s fit, some people would say it’s too dry; some people would say it’s too wet, and some people would say it’s just right. It’s an art.” He says that nasty weather can occur in any month, so if the ground conditions are right, you plant, and if not, you wait. Once the fall harvest has been gathered, it is not too early to start thinking about spring planting. “Maintenance of your planter is critical,” says Sinclair. 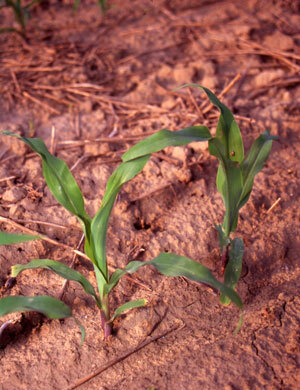 The best genetics and seed treatments are not going to substitute for planting at appropriate spacing and depth. After all, notes Sinclair, some things can be controlled and some cannot. “Do what you can to prepare beforehand because Mother Nature is usually going to throw something at you that you can’t control. How early is early for soybeans?